Despite inclement weather reports to include the sighting of a water spout in Tampa Bay, the rain couldn’t keep the crowds away from free food and family fun at George M. Steinbrenner (GMS) Field on Sunday, April 15, 2018 for the annual CABA Presents Taste of Carrollwood (TOC). In fact, the electricity in the air seemed to heighten the excitement of the Carrollwood Area Business Association’s (CABA) annual tasting and business expo. After parking for free in the Raymond James Stadium parking lot, the crowd was welcomed by the McDonald’s food truck serving free smoothies before attendees crossed the bridge to enter GMS Field. Upon entering the stadium, attendees were given a scavenger hunt sheet, and those who acquired all necessary vendor signatures were entered to win a 50″ flat screen, Smart TV. A stark contrast to the grey skies was the brightly colored Jumbotron with scrolling logos of TOC sponsors and vendors. Attendees would comment that the expo’s setting inside the New York Yankees’ Spring Training field (permanent home of the Tampa Tarpons) was unique and festive. Many kids (and their parents) stood in line for their long awaited turn to run the bases of GMS Field. Among the excitement in the crowd were entertainers to include Star Wars and Ronald McDonald characters long with a face painting artist, juggler, magician and balloon artist. Heralding the afternoon’s activities was USF’s Herd of Thunder marching band who took the field but refused to yield to overcast skies and a few rain drops. In addition to Spectrum Bay News 9, the media were represented by the event’s Platinum Sponsor, the Tampa Bay Times, Beasley Media (92.5 Maxima), the Taste of Tampa Bay Radio (AM 860), and The Advisor Magazine. There was no lacking of food or things to do with over 20 food vendors who provided generous samples to include everything from Marlow’s Shrimp & Grits to miniature, cream-filled tarts from Tiny Bites. Attendees had an opportunity to interact with a total of nearly 100 vendors who offered coupons and giveaways. Restaurants like Bonefish Grill, Noble Crust, and Carmel Kitchen offered generous BOGO coupons to encourage expo-goers to return to their Carrollwood locations. For those who wanted keepsakes to memorialize their Taste of Carrollwood experience, there were two photo booths from which to choose, and Shine Photo Booth offered attendees the ability to post pictures directly to their social media. 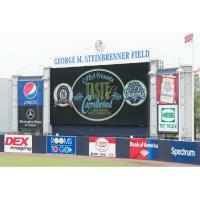 Why did the CARROLLWOOD Area Business Association choose George M. Steinbrenner field for their annual event? The Tampa Bay Timesexplained in its April 5, 2018 article: Restaurants showcase Dale Mabry as dining destination at Taste of Carrollwood. And establish themselves they did, on a rainy day in April,when over 3000 residents “stormed” into GMS Field.